Itchy, red or inflamed skin is a common issue for those with sensitive skin. At times, it can get dry or flaky as well. Finding the right moisturizer which does not make your skin itch even further can be quite a task. 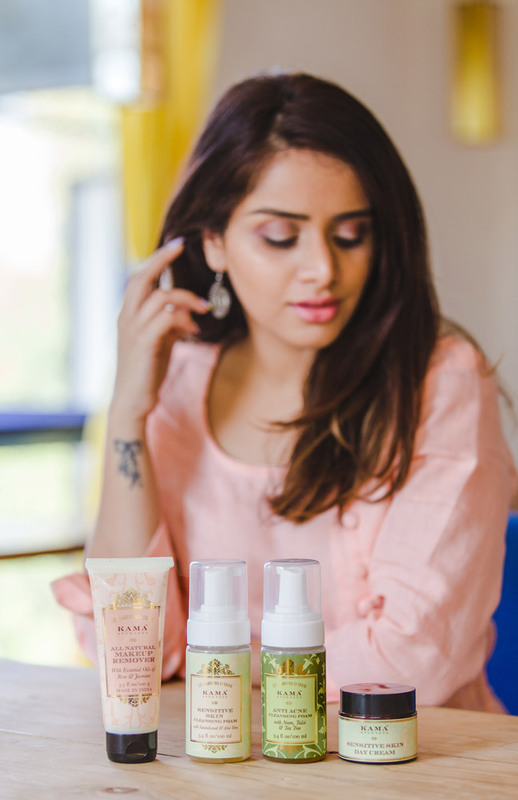 Recently, Kama Ayurveda, a 100% natural and organic Indian brand launched 4 amazing skin care products suitable for sensitive and acne prone skin. The recent additions include Anti-Acne Cleansing Foam, Sensitive Skin Cleansing Foam, Sensitive Skin Day Cream and All Natural Make-up Remover. 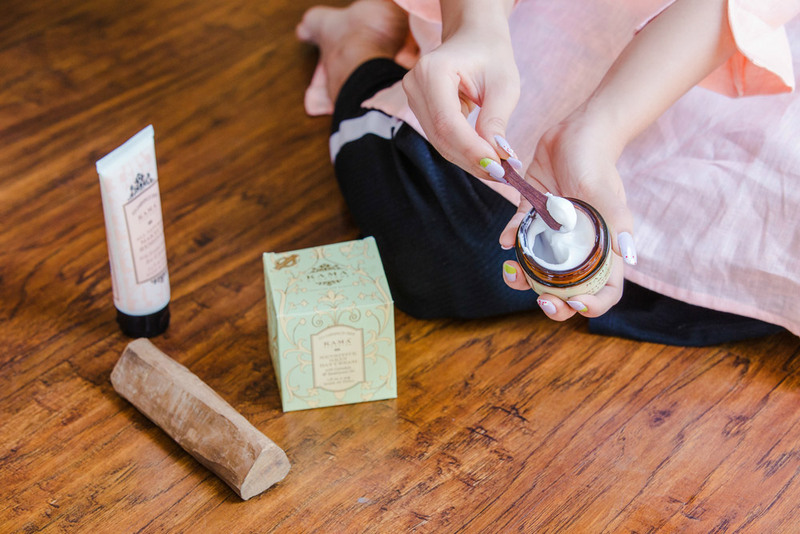 One of the most admirable attributes of Kama Ayurveda is that all their products are 100% natural, vegetarian and use the highest quality of natural ingredients. This ensures that the products are devoid of any artificial fragrance, colours and are completely organic. I incorporated their new products in my skincare regime awhile back so read on for the detailed reviews. Kama Ayurveda Anti-Acne Cleansing Foam comes in a white plastic bottle with a pump dispenser. The pump dispenses adequate amount of foam for cleansing the face and neck and does not have any particular scent. 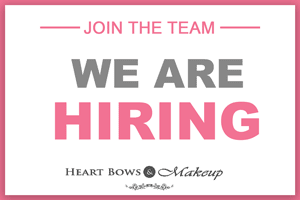 The product effectively cleanses the skin and removes dust, sweat and residual makeup. It is gentle on the skin and does not irritate the epidermis even if you have a flaring bout of acne. The cleansing foam lathers well and reveals a brightened complexion. It targets at reducing breakouts which most people with oily skin tend to struggle with. The Kama Ayurveda Cleansing Foam deeply cleanses the skin. As a result, the skin is refreshed instantly and provides a natural glow. The ingredient list is as impressive as it gets. It consists of Neem Oil which is known to reduce acne due to its anti-bacterial and anti-inflammatory properties. With the addition of Tulsi and Clarifying Tea Tree, the combination is great for acne prone skin. The product also contains plant derived salicylic acid to reduce breakout and boost cell renewal. While these ingredients keep the acne at bay, Calendula Flower and Aloe Vera Extracts cools, soothes and calms the skin. Cleansing is an integral step in a good skin care regime and this product is a great addition to the existing Anti-Acne products by Kama Ayurveda. It is amazing how the brand has conveniently structured products for every skin type. The Sensitive Skin Cleansing Foam from Kama Ayurveda is encased in a bottle with a small pump to draw out the product. Once again, the packaging has been wonderfully done with a sturdy body which is travel friendly and dispenses the right amount of product. The Kama Ayurveda Foaming Face Wash for Sensitive Skin is a great option for those with delicate and irritated skin which tends to gets worse in summers. Since cleansing needs to be done twice a day to prevent clogging of pores, this gentle product does the job quite well. The foaming face wash removes dust and dirt without stripping the skin of the natural moisture. It also calms and balances the skin as it contains pure Sandalwood Oil which is known for its anti-inflammatory and antibacterial properties. 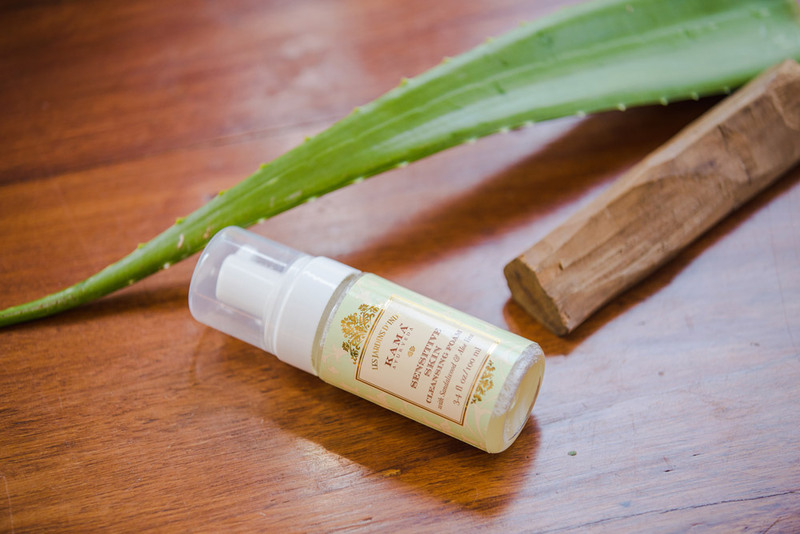 The presence of cold-pressed Aloe Vera leaf juice provides the necessary nourishment for the skin. It also contains Calendula which helps to soothe the skin from the excessive damage caused by environmental pollutants and reduces the redness caused by irritation. Overall, this is one of the best cleansers for sensitive skin and is also available in a travel sized packaging. An all-natural makeup remover which also manages to remove waterproof makeup? Yeah, I had the same surprised face when I came across the Kama Ayurveda All Natural Makeup Remover. I have been hooked to this makeup remover since the day I started using it. You need only a small quantity of product to remove every trace of makeup from the face, lips and eyes. I usually slather the product all over my face and gently massage it in a circular motion to remove the makeup. Then, I wipe it off with a damp tissue or cotton pad. It still amazes me how well this removes stubborn makeup despite being an all natural product. It also calms and balances the skin and does not make it oily. The natural formulation of various natural oils and butters like organic olive, jojoba and castor seed oil, with vitamin E-rich shea butter hydrates and nourishes the skin. These ingredients retain moisture while preventing premature ageing and help in preserving the luminosity of the skin. The product is non-comedogenic hence does not clog the pores or lead to breakouts. Kama Ayurveda Sensitive Skin Day Cream comes in a jar packaging with an opaque black lid. The packaging is classy and I love the pastel green and gold accents. A comforting moisturising cream is surely a necessity to provide the right hydration to the skin. With the Kama Ayurveda Sensitive Day Cream, a little product goes a long way hence it will last for a quite a duration. This product hydrates the skin and works as a great daily moisturizer. It strengthens the skin’s barrier to protect from pollution and chemicals. The day cream removes dry patches, soothes irritated skin and does not feel heavy or greasy. The impressive ingredient list is definitely its USP. The presence of Calendula Oil softens and soothes inflammation while Safflower Oil helps maintain the natural balance of the skin. If you are someone who suffers with irritated or red skin then this should definitely be in your kitty. 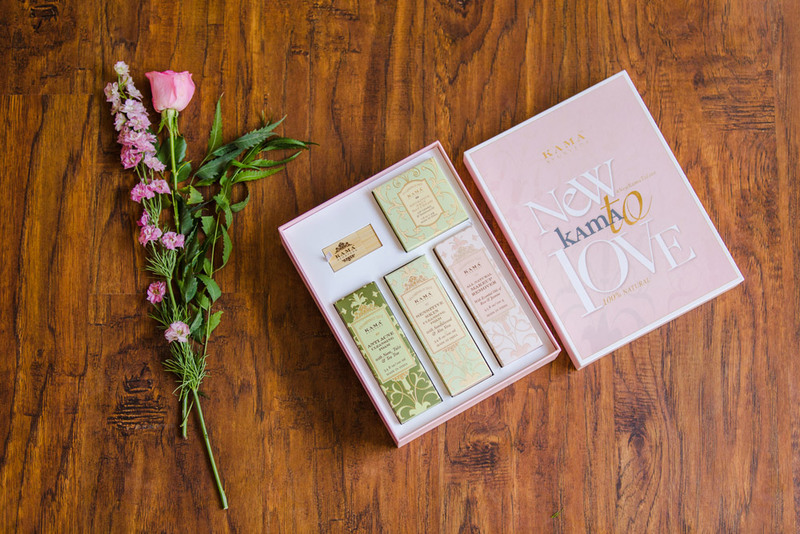 The impressive new launches by Kama Ayurveda have helped my skin look clearer, softer and more balanced. I love the fact that all the ingredients in the products are natural hence will not be harming my skin in any way. I highly recommend you check out the new additions to their already impressive line of skincare products.